On September 17, 1862, the "United States" was on the brink, facing a permanent split into two separate nations. America's very future hung on the outcome of a single battle--and the result reverberates to this day. Given the deep divisions that still rive the nation, given what unites the country, too, Antietam is more relevant now than ever. The epic battle, fought near Sharpsburg, Maryland, was a Civil War turning point. The South had just launched its first invasion of the North; victory for Robert E. Lee would almost certainly have ended the war on Confederate terms. If the Union prevailed, Lincoln stood ready to issue the Emancipation Proclamation. He knew that freeing the slaves would lend renewed energy and lofty purpose to the North's war effort. Lincoln needed a victory to save the divided country, but victory would come at a price. Detailed here is the cannon din and desperation, the horrors and heroes of this monumental battle, one that killed 3,650 soldiers, still the highest single-day toll in American history. 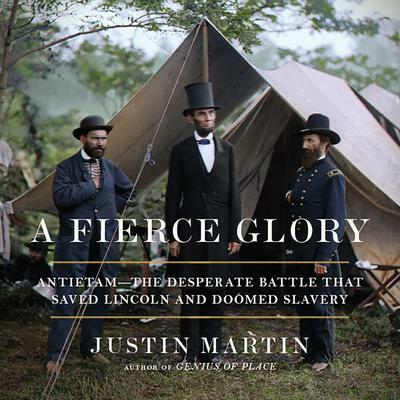 Justin Martin, an acclaimed writer of narrative nonfiction, renders this landmark event in a revealing new way. More than in previous accounts, Lincoln is laced deeply into the story. Antietam represents Lincoln at his finest, as the grief-racked president--struggling with the recent death of his son, Willie--summoned the guile necessary to manage his reluctant general, George McClellan. The Emancipation Proclamation would be the greatest gambit of the nation's most inspired leader. And, in fact, the battle's impact extended far beyond the field; brilliant and lasting innovations in medicine, photography, and communications were given crucial real-world tests. No mere gunfight, Antietam rippled through politics and society, transforming history.